Greenpeace has published a grimly fascinating first-person account of visits to the rusting Chinese 'zombie ships', abandoned pirate fishing boats floating off the West African coast that have been repopulated with crews to (illegally) fish the waters. These floating wrecks are loaded, supplied and collected from at sea, with 'high value' fish going to Las Palmas in the Canaries to be packaged ready for European clients. The 'dirt' fish goes to Africa. The ships receive only the most basic of maintenance. 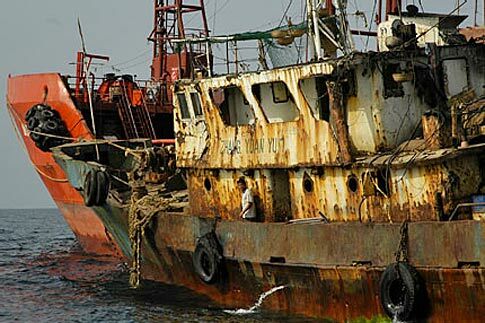 They are floating wrecks, haemorrhaging fuel and rotting to the water-line. Their crews are left on them for years at a time. Last year one of the ships sank, taking 14 crew with it. Click here for the Greenpeace article and more pictures. "Daddy, I want an Axolotl"
Most girls want a puppy, or a kitten, or a pony. But my eldest daughter Sky wants an Axolotl. Seeing her blog entry took me back to my first encounter with one of these strange creatures, staring impassively at me from a small fishtank in my school's biology lab. I don't remember wanting one, but I did ask our long-suffering biology teacher, Mr Cotmore, what it was. His answer ("It's called an Axolotl, it's an amphibian.") didn't help much, but a quick trip to the school library revealed that the Axolotl (pronounced Ax-oh-lot-ul) is no ordinary amphibian. 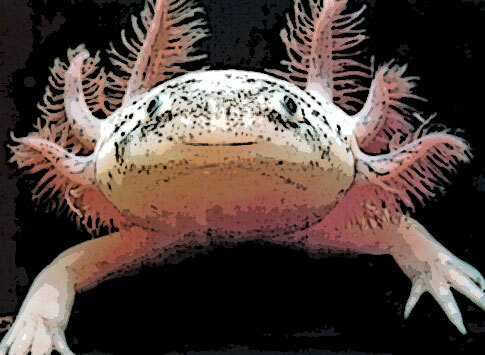 The Axolotl exhibits a phenomenon known as neoteny. Most amphibians grow via metamorphosis, moving from egg to larva (the tadpole stage in frogs), before adopting their adult form. The Axolotl's development freezes at the larval stage, complete with its trademark gills and fins. In very rare cases Axolotl's can metamorphose spontaneously to their 'adult' form. An adult axolotl is a rare (and sickly) thing, but it bears a close resemblance to the Mexican subspecies of the Tiger Salamander. The Axolotyl is an endangered species in the wild, however, it seems to have discovered a new ecological niche, science laboratories, where it is studied for its healing/regeneration abilities. Normal wound-healing in animals occurs through the growth of scar tissue, and this also means that they cannot re-grow a lost limb. The Axolotl can re-grow limbs, and even accept transplants from other Axolotls, including eyes and parts of the brain - restoring these alien organs to full functionality. In some cases, Axolotls have been known to repair a damaged limb as well as regenerating an additional one, ending up with an extra appendage. There are even records of a decapitated Axolotl regenerating its head. I buy a lot of music. Most of it on Compact Disc, some of it via eMusic.com, and if I can't find it anywhere else, a few tracks from the iTunes site. This is primarily a cost thing, Apple's prices aren't exhorbitant, but they aren't even close to eMusic's rates. The second thing is that the tracks on the iTunes site are copy-protected. I hate copy protection, I hate it in principle, and I hate it in practice (but that's another blog). 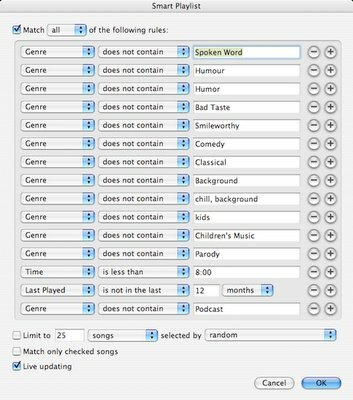 Up until iTunes 6, there was a clever program called JHymn which removed the copy protection codec without interfering with the audio data. iTunes 6 rendered JHymn impotent, and it doesn't look as if there is going to be a solution arriving any time soon. 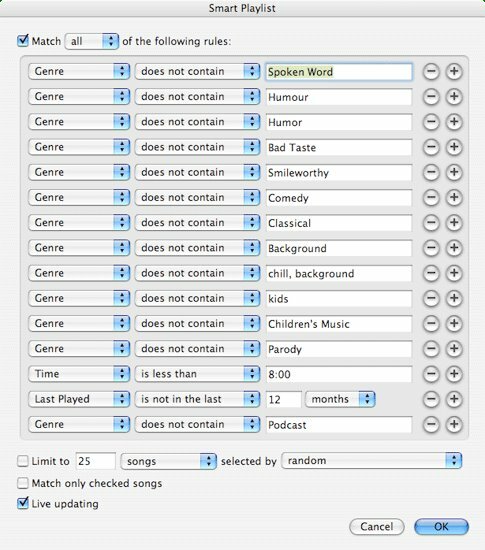 There are at least two other ways of disabling the copy protection on iTunes tracks. The first one is to use software like AudioHijack to re-digitise tracks. Tests I have done with this results in a significant decrease in audio quality. The second way is to burn a CD from iTunes, then re-rip the CD back on to iTunes. Audiophile web sites I've browsed report that is also results in a significant reduction in quality, and so I have avoided employing it. Recently one of my children asked for a song I had recently downloaded off the iTunes site. I used the 'copy to CD' method to remove the encryption and, because I was using up a CD, put a number of other tracks on it as well. As an experiment, I made up a playlist for my iPod with the original iTunes tracks and the 'double-ripped' versions back-to-back, and played them through my car's (substantial) stereo system on the way home. Try as I might, I couldn't hear the difference. I'm sure that if you ran the two tracks through an oscilloscope, there would be, but not that my ears could detect. So I now have a clumsy but effective way to remove the encryption from my iTunes store downloads. It left me thinking over the whole area of what it is that makes something 'yeuch! ', 'good enough', 'brilliant' and 'even more brillianter, but not so much brillianter that I'm willing to pay any more for it'. With music and video, I push towards the top end of the scale, I love listening to loud, clear, articulately delivered music, and watching high-definition movies on a big screen. I have friends who aren't so bothered. They make polite noises about my home-cinema, but with no indication that they would want to own one themselves. Last weekend myself and a good friend (Aaron) paid a visit to the Tate Modern to be by turns impressed and appalled at the various installations and exhibits. After that we visited a place called 'Vinopolis' for an introduction to the joys of wine tasting. It was a very enjoyable few hours, and I got the chance to sample wines way above my usual price-point. What did surprise me was that while I enjoyed the 'nose' of the very good wines, my mouth didn't enjoy them as much as some of the less expensive vintages. In short, I really enjoyed the experience, but it hasn't convinced me that buying wine that is above the £5-7 range is worth the cost. Maybe my taste buds are less sensitive than my eyes and ears? Or maybe I've just spent less time in the aesthetic arena of aromas and tastes? Maybe if I'd stuck with more basic audio-visual equipment I'd be enjoying myself just as much for a lot less money! It is always worth a visit (thanks Jason for making me aware of its existence), but Passionate's most recent post is very close to my own heart (and head!). Multitasking has to be one of the biggest myths of our generation. 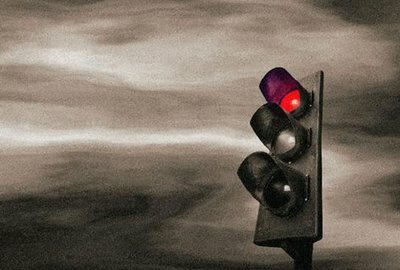 Most of us know we can only do one brain-intensive thing (properly) at a time, and yet we still find ourselves trying to do far too many things at once. I am (gradually) learning to do things consecutively rather than concurrently, and find that I get things done a lot quicker, better and with a lot less stress. If you know it needs doing - and you can do it now - do it. Now. There are so many tiny things that we leave until the last minute, and there are often 'dead spots' in our day when we could get them done. 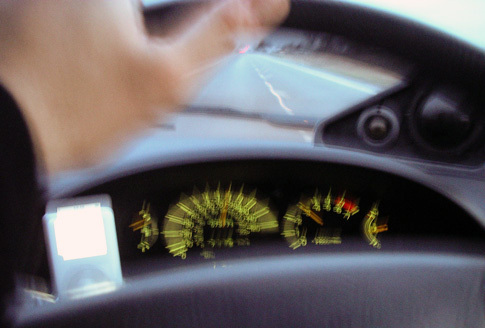 I know I'm a control freak, and that what works for one person doesn't always work for someone else, but learning to exploit those 'five-minute' gaps has created more 'quality-time' and less stress. If you've got a Mac, and it's running OSX 10.4 (Tiger), then you also have an application running in the background called Dashboard. Hit F12 and it appears, revealing a number of attractive 'widgets'. Some people love it, as the hundreds of widgets available on the web testifies. I never use it, and whenever I run Activity Monitor I can see it is eating up precious CPU cycles. It also accesses the internet at regular intervals. 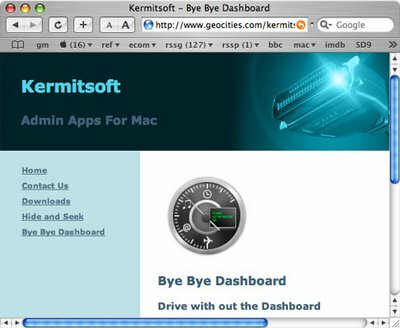 Bye Bye Dashboard is a free utility that curtails Dashboard's processor cycle munching activity. And if you decide you want Dashboard back again, it will dutifully resurrect it. I've not done any scientific tests, but first impressions are that my PowerBook's Finder seems more responsive without Dashboard running. In 1623 Salomone Rossi published sheet music for his composition Ha-shirim asher li-shelomo, a collection of 33 Psalms, hymns, and liturgical poems for festive synagogue occasions. I'm fairly sure you don't own a copy, and that you're not aware it was the first sheet music to be printed with a Hebrew typeface. I'm also guessing your deplorable ignorance on this matter wasn't bothering you overmuch. What is more interesting is the inscription printed in the preface, setting out a rabbinical curse on anyone who copied the contents without permission or recompense to the composer. We have agreed to the reasonable and proper request of the worthy and honored Master Salamone Rossi of Mantua... who has become by his painstaking labours the first man to print Hebrew music. He has laid out a large disbursement which has not been provided for, and it is not proper that anyone should harm him by reprinting similar copies or purchasing them from a source other than himself. Therefore... we the undersigned decree by the authority of the angels and the word of the holy ones, invoking the curse of the serpent's bite, that no Israelite, wherever he may be, may print the music contained in this work in any manner, in whole or in part, without the permission of the above-mentioned author... Let every Israelite hearken and stand in fear of being entrapped by this ban and curse. And those who hearken will dwell in confidence and ease, abiding in blessing under the shelter of the Almighty. Amen. Creating the initial printing plates for a book was laborious and expensive. Authors of a publication would make deals with printers, usually involving a one-off payment for the rights to print their work, which the printer would write off against the subsequent books sales. However, once the original plates had been constructed, making copies was comparatively simple and inexpensive. It wasn't long before print operators looking to supplement their income started selling duplicate plates to unscrupulous printers who would produce and sell the virtually identical products, robbing the original printer of income. As we saw in the last article, copyright's origins lay in government's desire to control information, and to gain revenue from it. The rights of the author were considered secondary. The modern concept of copyright didn't arrive until 1710 when the British Statute of Anne gave exclusive rights to authors rather than publishers. Not only that, but it prevented publishers from controlling a publication after it had been purchased. This meant that once a book was sold, its owner could lend, or re-sell it if they chose. It also limited the duration of a publisher's exclusive rights to 28 years, after which works would pass into the public domain. The Berne Convention for the Protection of Literary and Artistic Works of 1886 initiated the concept of copyright that extended beyond the boundaries of just one country. Not only that but copyrights became automatically assumed, so, as soon as a work is written or recorded on some physical medium, its author is automatically entitled to all exclusive rights to the work and any derivative works until the copyright expires. Up to this point, not many people would argue that the concept of copyright was moving in the right direction, with the rights of author and consumers alike being defended. Most of us benefit from the concept of people being financially recompensed for work that they do, and the equally important conviction that your property is worthy of protecting. It looks like the issue of who 'owns' and 'controls' a product after it has been purchased isn't confined to the entertainment industry. Vnunet reports that the UK has warned America that it will cancel its £12,000,0000,0000 (count those noughts!) 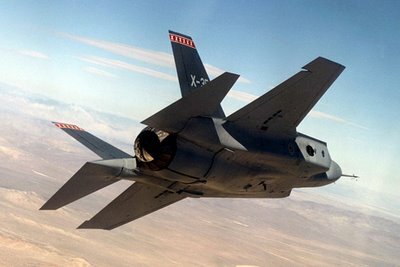 order for the Joint Strike Fighter if the US refuses to give full access to the computer software code that controls them. Apparently the current software in the hi-tech jet fighters could be remotely disabled by the Americans. The UK's Minister of Defense, Lord Drayson, is currently in Washington speaking with members of Congress, apparently explaining that Britain has a 'Plan B' if the Joint Strike Fighter deal falls through. Forget cockroaches, tardigrades (Kingdom - Animalia, Phylum - Tardigrada, Common name - Water Bear) are probably the world's hardiest creature, and they're cute! Tardigrades were first discovered in 1773, since then about 400 distinct variations have been identified. Tardigrades inhabit semiaquatic environments, sometimes in numbers exceeding 1.5 million per square meter. They range in size from .1 to 2mm long. They have eight legs, each with clawed toes. Tardigrades move with a slow, lumbering gait, hence their common name. 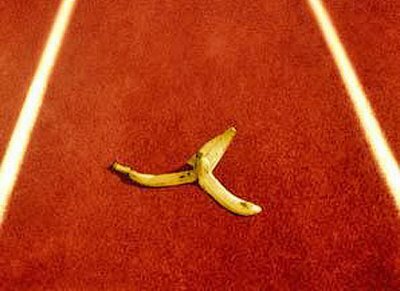 The name 'tardigrade' comes from the Latin 'tardus', meaning 'slow', and 'gradus', meaning 'step'. - Tardigrades can survive being heated for a few minutes to 151°C or being chilled for days at -272.8°C (nearly absolute zero). 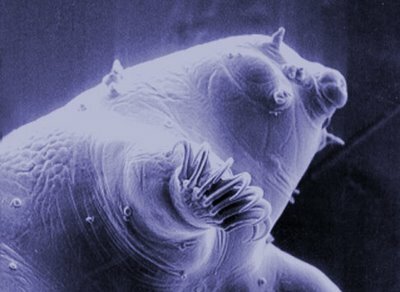 - Tardigrades can withstand 5700 'grays' of x-ray radiation. (Five grays and a human is toast). - Tardigrades can weather the nearest thing we can simulate to a vacuum right through to 6,000 times atmospheric pressure. Tardigrades' immense resilience stems from their ability to slow their metabolic activity to a crawl, a phenomenon called anabiosis. 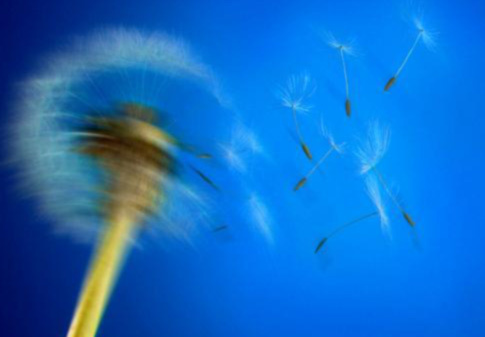 When conditions become even more extreme, they employ a 'near death' stage of dormancy called cryptobiosis. 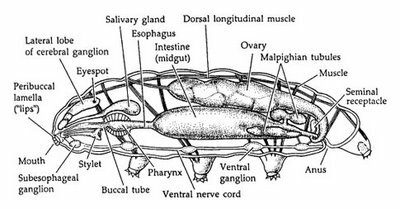 During these periods tartigrades secrete envelopes around their bodies known as tuns. Tardigrades can survive in their tuns for an indefinite period of time. Museum workers who moistened a 120 year-old dessicated moss sample found living tartigrades within hours. Tardigrades feed upon detritus, fresh plant material and smaller invertebrates. Fascinating fact to throw into a lagging conversation: The true (although not so cute) King of Radiation is the foul-smelling red-coloured bacterium Deinococcus Radiodurans (nicknamed 'Conan the Bacterium' by its admiring researchers). It was discovered in irradiated canned meat that had still managed to 'go bad'. This plucky bacterium happily grows in 1,500,000 rads of radiation - and, if frozen, over 3,000,000 rads! 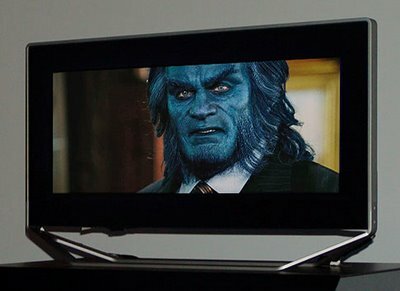 LCD vs Plasma? Or SED? Over the last two years, flat panel television display sales have been growing by 100% year-on-year. 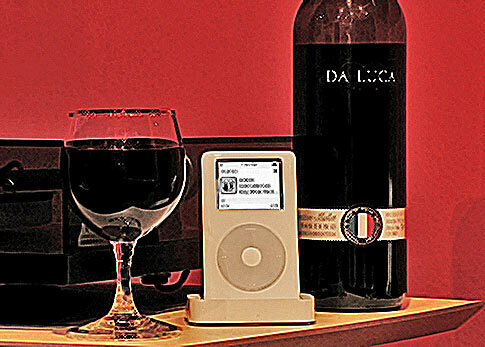 Plasma displays were (next to the iPod) the 'big' Christmas present in 2005, and healthy sales are reported in the first quarter of 2006. Plasma was the first technology used for large flat panel displays. 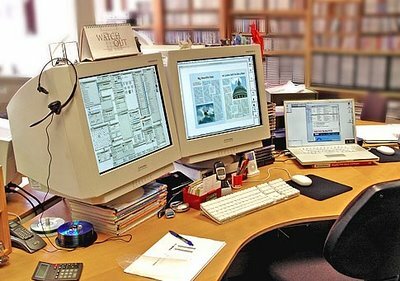 Initially they were obscenely expensive, with picture quality and viewing angles significantly worse than conventional CRT (cathode ray tube) screens. However, the technologies have been refined to bring the prices down and the quality levels up. Over the past couple of years, plasma's ascent has been challenged by LCD (liquid crystal display) technology. This is the technology used for laptop computer displays, and your mobile phone's colour display. LCDs are cheaper, brighter, more durable and stay bright for longer. Their disadvantage is that they don't display movement as well (although modern LCDs are conquering this). However, just when you thought the decision was Plasma v LCD, a third technology has been announced. 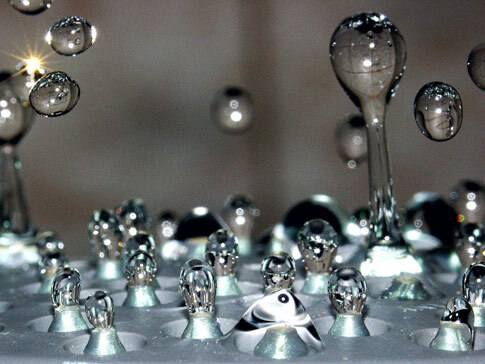 The technology is called SED, which stands for surface-conduction electron-emitter display. And this week, Toshiba and Canon announced that the first SED flat panel TVs will go on sale in the fourth quarter of next year. The panels have a reputation for delivering clear and vivid images because their light-beaming technology is similar to that for old-style cathode-ray tube TVs. SED panels are also thinner and consume less energy than LCDs and plasma display panels. If your old telly has died, good-quality plasma and LCD screens have never been cheaper. But if it has a couple of year's life left in it, it just might be worth waiting! If you use Google Mail, and you run OSX, this is an elegant way of importing details from Address Book into your GMail contacts database. A to G (formerly AddressBookToCSV) is a one-trick pony for getting your Mac OS X Address Book contacts into GMail. 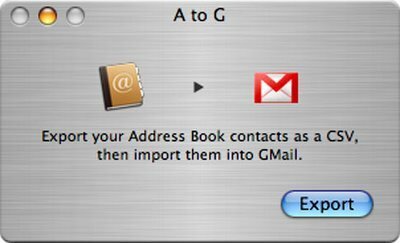 Simply export your Address Book as a CSV file using A to G, then import that file into GMail using GMail's Contact import feature. Worked seamlessly for me, even being intelligent enough to not duplicate contacts I already have, and to give separate fields for those entries where there is more than one email address. Dean Kamen is a very clever, very rich inventor and entrepreneur. While still a college undergraduate, he invented the first wearable infusion pump. In 1976 he founded his first medical device company to manufacture and market the pumps. At age 30, he sold that company to Baxter International Corporation for enough money to mean he never had to work again. Recently his Segway personal transportation device has gained a lot of headlines, if not much commercial success. Dean Kamen has recently been focussing on two of the biggest issues facing humans on this planet, the estimated 1.1 billion people in the world who don't have access to clean drinking water, and the estimated 1.6 billion don't have electricity. "Eighty percent of all the diseases you could name would be wiped out if you just gave people clean water," says Kamen. "The water purifier I've designed produces 1,000 litres of clean water a day, and it doesn't care what goes into it. And the power generator makes a kilowatt off of anything that burns." Kamen has been joined by Iqbal Quadir, the founder of Grameen Phone, the largest cell phone company in Bangladesh. Last year, Quadir took prototypes of Kamen's power machines to two villages in his home country for a six-month field trial. That trial, which ended last September, sold Quadir on the technology. So much so in fact that Quadir's startup, Emergence Energy, is negotiating with Kamen's Deka Research and Development to license the technology. Quadir then hopes to raise $30 million in venture capital to start producing the power machines. The electric generator is powered by an easily-obtained local fuel: cow dung. Each machine continuously outputs a kilowatt of electricity. That may not sound like much, but it is enough to light 70 energy-efficient bulbs. As Kamen puts it, "If you judiciously use a kilowatt, each villager can have a night time." The real invention here, though, may be the economic model that Kamen and Quadir hope to use to distribute the machines. It is fashioned after Grameen Phone's business, where village entrepreneurs (mostly women) are given micro-loans to purchase a cell phone and service. The women, in turn, charge other villagers to make calls. "We have 200,000 rural entrepreneurs who are selling telephone services in their communities," notes Quadir. "The vision is to replicate that with electricity." During the test in Bangladesh, Kamen's Stirling machines created three entrepreneurs in each village: one to run the machine and sell the electricity, one to collect dung from local farmers and sell it to the first entrepreneur, and a third to lease out light bulbs (and presumably, in the future, other appliances) to the villagers. Kamen thinks the same approach can work with his water-cleaning machine, which he calls the Slingshot. While the Slingshot wasn't part of Quadir's trial in Bangladesh, Kamen thinks it can be distributed the same way. "In the 21st century, water will be delivered by an entrepreneur," he predicts. The Slingshot works by taking in water-based liquid - even raw sewage - and separating out the clean water by vaporizing it. It then shoots the remaining sludge back out a plastic tube. Kamen thinks it could be paired with the power machine and run off the other machine's waste heat. Compared to building big power and water plants, Kamen's approach has the virtue of simplicity. He even created an instruction sheet to go with each Slingshot. It contains one step: Just add water, any water. "Not required are engineers, pipelines, epidemiologists, or microbiologists," says Kamen. "You don't need any -ologists. You don't need any building permits, bribery, or bureaucracies." Kamen's goal is to produce machines that cost $1,000 to $2,000 each. That's a far cry from the $100,000 that each hand-machined prototype cost to build. Quadir is going to try and see if the machines can be produced economically by a factory in Bangladesh. If the numbers work out, not only does he think that distributing them in a decentralized fashion will be good business - he also thinks it will be good public policy. Instead of putting up a 500-megawatt power plant in a developing country, he argues, it would be much better to place 500,000 one-kilowatt power plants in villages all over the place, because then you would create 500,000 entrepreneurs. Fascinating fact to throw into a lagging conversation: Dean Kamen's father is Jack Kamen, the illustrator of Weird Science and other EC Comics. Will Wright is the creator of Sims, the world's most popular PC game. His latest project is a game where you can be involved in constructing an entire universe, including the life-forms that inhabit (and explore) it. Tidepool phase: In the game's initial stages, the action has been likened to Pac-Man, except there's no maze, and you get to change the look and functionality of your character by consuming other characters, and by using a comprehensive set of(3D) tools. Evolution phase: Once the character becomes more complex, the game moves to a three-dimensional RPG, which many reviewers compare to Diablo. In this stage you run around, fight, feed and mate. Tribal phase: By this time your creature has matured physically, it is time to develop its brain. 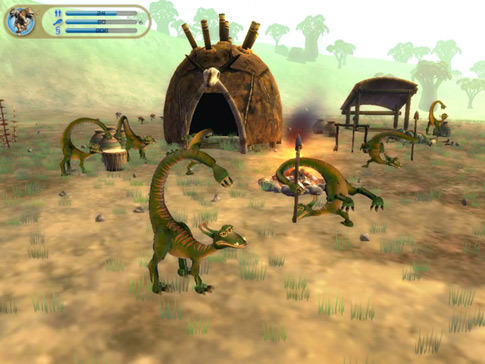 At this point the game gears up to an RTS interface (Civilization, Age of Empires) where you begin to groom a tribe of creatures with provisions, tools and social skills. City phase: This phase is much like Wright's earlier game, SimCityHere the game becomes more like Wright's own SimCity, deciding on what shape your tribe's environment will take, including the buildings, technlogy and society rules. Civ phase: Once your dwellings are built and law-and-order established, you can start interacting with the 'outside world'. This is where the game becomes more like Civilization, and it can be handled militaristically or diplomatically; on foot, in boats or by airship. The goal is (of course) for your tribe to control the planet. Invasion phase: With one world under your belt, you take on space travel, colonising and even building your own planets. There is an entire galaxy of solar systems to explore and meddle with. This part of the game is the biggest, and the most open-ended. Many of the worlds are already populated, and you can be diplomatic or destructive as you try and make sure your civilisation propers and grows. As Wright says. "Usually you get the sandbox gameplay as training wheels for the goal-oriented content. Here, the goal-oriented game is training you for the open-ended sandbox." Another part of the game that looks like it will be a lot of fun are the character editing tools, an interface that the creator describes as "part Mr. Potato Head, part Etch-A-Sketch, part modeling clay". Spore players will also be able to go 'online' and share their creations with a central database and fetch others' work to help populate their own 'world'. No simultaneous multiplayer activity is planned (sorry World of Warcraft fans) but each game environment will be able to feature creatures, structures, vehicles and ultimately entire worlds created and exchanged over the Internet. The original game is PC-based but like Sims, it can be ported to any platform. Wright claims the data shared among users is incredibly compact and should be no trouble to store or transfer, meaning that even a Nintendo DS cart could potentially store an entire galaxy of content. My immediate thought is that this could be a killer app for mobile phones, combining communication, creativity and competition in one fascinating program. Visit VideoGoogle to see a fascinating 35 minute demo. The 15th century was a time of immense intellectual and social change, and printing allowed the economic duplication and distribution of the ideas that fuelled it... especially by the fast-emerging group of religious rebels who were daring to question the Church of Rome’s teachings. In 1517 Martin Luther posted his 95 theses on the door of the Church at Wittenburg. Within weeks printing presses were running around the clock to spread its revolutionary message. In the same year Henry VIII instructed the Chancellor of the University of Cambridge to appoint three printers who could print and publish any books of which the Chancellor and three doctors approved. What is especially significant about this act is that it later formed the basis for the development of copyright law. After attempting to control the spread of ideas, the ability to make money out of intellectual property entered the agenda. In 1547 Edward VI granted a monopoly to a group of approved printers to produce specific categories of material, with taxes (yep, 'royalties') being paid to the king for each item sold. In 1556 the Stationers' Company was established by royal charter. It had a monopoly over printing and powers to enforce it, including the right to inspect a printer's operations and to act as customs officials to intercept trade in books. They took their jobs very seriously, using torture to gain confessions as well as executing traitors. The ‘ownership’ of material continued to be in the hands of the ruling authorities, until the British Statute of Anne in 1710. This gave exclusive rights to authors rather than publishers, and it included provisions to prevent publishers controlling the work. It also limited the duration of such exclusive rights to 28 years, after which all works would pass into the public domain. Now all of this is just scraping the surface of the discussion (just type ‘copyright’ into Google or Wikipedia, or visit Brendon Scott’s excellent article if you’ve got a lot of time on your hands). Suffice it to say that the modern arguments about the ‘rights’ of authors to gain recompense for the distribution of their work aren’t new, simple or very interesting. In Digital Ethics #10 I’ll be taking a look at some historical examples of how people have pragmatically approached the distribution of their creative work. 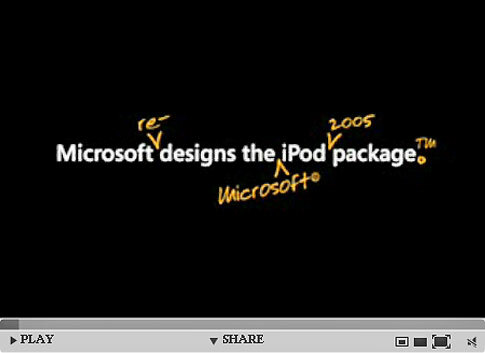 for a hilarious and perceptive video that explains what Apple gets right, and Microsoft gets wrong. Thanks to Conrad for pointing this out. It's official, you can have pain, and be happy! Salon.com posted an interesting article on Steven Hayes, a 57-year-old University of Nevada professor whose new book, 'Get Out of Your Mind and Into Your Life', says the western obsession with feeling good is preventing us from living well and that (and here's the revelation!) living life to the fullest means embracing pain. Mr Hayes has pioneered the school of "acceptance and commitment therapy." ACT is an approach to mental and behavioral health that questions traditional cognitive therapy and is being referred to as "third-wave" psychology (following second-wave cognitive therapy and first-wave behavior therapy). 'pain is ubiquitous and suffering is normal. If you ask people, "Are you happy?" many of them are going to say yes. But if you ask people, "Is this really what you want your life to be about?" many more are going to say no. Say you've been betrayed in love. Now, the reasonable, sensible thing to do is say, "I'm not going to be that vulnerable again." But precisely the reason you loved to begin with was because you wanted to be intimate, known, connected. That's the reason it hurt so much. But because you don't want to be vulnerable, it prevents you from being connected and intimate, even if you are in a relationship. Now, would a person who's living in a relationship like that say they're happy? They might. But do they have the intimacy and connection they so badly want? No. We don't get good training in how to sit with pain anymore; [we used to have] spiritual traditions of fasting, where you didn't eat even though you were hungry in order to connect with the suffering of other people. Most of those traditions are gone. Now it's only the educated elite who go for 10-day silent meditation retreats who get that kind of experience. What I'm saying is find a middle path. My work is about a loving posture: Accept your history, feel your feelings, notice your thoughts, and carry all that forward down a path that you value that's neither indulgence nor suppression. Life is painful... There is a base level of pain: for example, knowing you're going to die. So yes, life includes a big chunk of pain, and it includes a big chunk of living. But if you're not willing to have the pain, you're not going to get the living.